Nick's adventures continue in the sequel, Train Boys. Nick is now three years old and simply adores trains of all sizes and kinds - wooden trains, Thomas trains, commuter trains, Amtrack! In Train Boys you will take a trip to Washington's historic Union Station with Nick and his dad and see why trains are so totally exciting and fun (and educational too). It's a joyous ride, and Nick is a delightfully entertaining host. 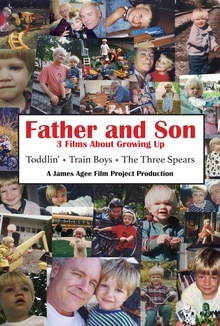 Train Boys is Part Two of the trilogy Father and Son.